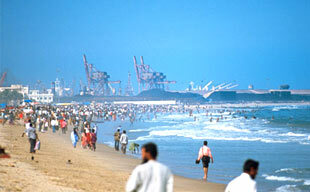 Tamil Nadu is a state of south India bestowed with treasured beaches of the Indian coastline. The itinerary of Tamil Nadu Treasured Beaches Tour is one of the great ways to explore the bounties of diverse beaches alongside the Bay of Bengal. Beginning from the city capital, Chennai; the tour moves towards heritage beach town of Mahabalipuram and French Riviera of Pondicherry. Towards the middle, the tour takes a cultural side with an illustrious visit to Swamimalai and royal Chettinad region in Karaikudi. Rameshwaram, an island town is known for beach with a difference. From a distance, it looks like a giant river waves stretching at max 3 cm high, unlike the aggressive waves of the bay. This cultural experience is enhanced with a visit to unique Indian beach of Kanyakumari, which forms the last beach of this Tamil Nadu Treasured Beaches Tour. But worry not. The tour is still in place with a mesmerizing visit to Madurai and experiencing the chill of hill stations at Kodaikanal and Ooty. On arrival at Chennai Airport, you will meet the Incredible India Tour representative who will guide your transfer to the hotel in the city. Later begin with the charming sightseeing of Chennai, the cosmopolitan city of south India. The Gateway of South India, Chennai is known for its cosmopolitan culture yet the essence remains refined with Tamilian essence and aesthetics. The sightseeing of Chennai is also a window to the heart of Tamil Nadu ingrained with the spirit of South India. Begin your Chennai city tour with a visit to National Art Gallery and Museum (closed on Fridays). The complex contains the finest selection of ancient paintings from all schools of artistic brilliance as well as modern artistic magnificence. Later you will move towards Fort St. George, the first English fortress in India and St. Mary’s, the oldest British church in India. Later advance towards your Tamil Nadu Treasured Beaches Tour through a wholesome drive alongside the second largest beach in the world, Marina. Spend your time in leisure observing the high tides of the evening and later move to San Thome Cathedral, a minor Roman Catholic basilica in Chennai. Later in the evening, indulge in the shopping spree at this chirpy city. After breakfast at Hotel, move towards the world heritage site, Group of Monuments at Mahabalipuram. Check in at the hotel at Mahabalipuram. Located around 65 km south of Chennai, Mahabalipuram was the ancient city of Pallavas and is known for its open air stone relief structures. The only surviving sea shore temple is also one of the prominent attractions of visiting Mahabalipuram. The rock hewn structures and monolithic temples of this heritage coastline make Mahabalipuram popularly known as the City of Seven Pagodas. The group of monuments is richly ingrained with a fusion of sculpture art form and religion. Everything said about this heritage site falls short when you actually visit these scintillating and larger than life stone reliefs. Overnight stay. From Mahabalipuram, you are all set to enter a union territory of India located just 132 km away, Pondicherry. A sea pouting paradise, Pondicherry is a little France in the south of India. After reaching Pondicherry or Puducherry, check in at the hotel. Later visit Aurobindo Ashram, Auroville and Gandhi Museum. 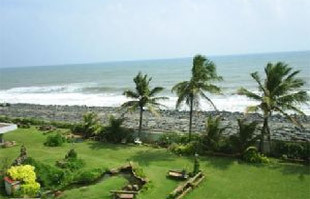 But don’t forget to visit the rocky and serene Pondicherry beach. Spend your day in observing the refined French culture of this region where even a rickshaw puller is equipped with the nuances of the language. Enjoy the tasteful French cuisines and later rest in the hotel. After breakfast, drive to Karaikudi. Enroute visit Tanjore, the temple town famous for Brihadishwara Temple. The Big monolithic granite temple, Brihadishwara is a world heritage monument at par with the architectural feat similar to Pyramids of Egypt. The temple tower rises to a height of 15 meter from a square base of 29 meter and then tapers off, making a total of 66 meter. Many of the treasures of Tanjore and the surrounding area are housed in Art Gallery and Saraswati Mahal Library within the Palace. The limestone house city of KARAIKUDI comprises the Chettinadu region or the land of Nattukkottai Chettiars. Chettinadu region is famous for its fortress like homes and temples that are architectural marvels and lip smacking food. Chettinadu Chicken is a spicy delight available in the region prominently. The houses of Karaikudi are a conglomeration of varied architectural building styles. Burma teak motif, stained glass windows, handmade tiles, elaborate chandeliers and intricate carpentry are all unique ingredients of Chettinadu Mansion. After breakfast, leave Karaikudi for Rameshwaram, the most sacred temple town of India is an island blessed by the epic episode of Ramayana, where Lord Rama is said to have visited before going into battle of Sri Lanka. After defeating Ravana, Rama as a thanksgiving gesture installed a lingam, an iconic symbol of Shiva for blessing made by Sita, his consort. The sacred lingam is present in the Ramanatha Swami Temple standing close to sea on the eastern side of the island. 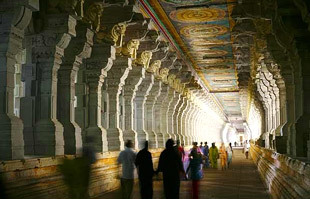 The magnificent pillared corridor is another reason why many of the tourists choose to visit this sacred spot. The other attraction of Rameshwaram is its still beach with no waves at all. The waves rise at the max of 3 cm. Lunch at local restaurant. Proceed towards the hotel for dinner. After breakfast drive to Kanyakumari, the southernmost tip of India where the three giant oceans merge to form a beautiful beach. Often named as Alexandria of the East, Kanyakumari is a great cultural confluence of art, civilization, pilgrimage and heritage of India. When you step on to the beach, you will just wish to visit the offshore tourist attractions. Intrigued by the Thiruvalluvar, the saint poet’s statue, you will just marvel at the beauty of this beach. The multicoloured sand and green sea rock along side the sea shore makes this beach a bewitching example of natural beauty. The fulfilling excursion of the day includes a visit to the local deity, Kanniyakumari Amman temple, Vivekananda Rock Memorial, Gandhi Memorial and Thiruvalluvar Statue. Seal the day’s end with the illustrious sunset at Kanyakumari Beach. You can purchase sea shells and other table tops at the local markets alongside the beach. If you are an early riser, then don’t miss the sight of sun rising in the glory of Kanyakumari beach. After breakfast in Kanyakumari, drive to Madurai, the Indian city at par with the heritage or Athens and Greece. Madurai, the city of sweet nectar is one of the oldest cities of South India designed excellently in the shape of a lotus motif. In the center of the city rules Meenakshi Temple, dedicated to the goddess and her consort, Sundareswar. The thousand pillar mandapam, water tanks, carved columns, courtyards and 12 towering gopurams contribute to the magnificence of Meenakshi Temple. Inside the corridor, don’t be shocked to spot an elephant; instead offering him bananas will bring you good luck. In the evening, visit Thirumalai Nayakkar Temple for the amazing light and sound show. Drive to Kodaikanal in the morning and check-in to the hotel to relax. Kodaikanal or fondly addressed as Kodai is the gift of the forest where once in every 12 years Kurinji flower blooms and spreads fragrance in this mesmerizing hill station. Walking through the picturesque points, gurgling waterfalls and steep rock out drops are the attractions of Kodai. Later proceed towards the sightseeing of Kodaikanal including a visit to blushing Bryant’s Park famous for its flowers, hybrids and grafts in a glasshouse, Green Valley View, Coakers Walk, Silver Cascade Waterfalls and Silent valley. Later proceed towards Kodai Lake where beautiful boat riding experience awaits you in the evening. Leave Kodaikanal for Ooty, another English hill station in the Nilgiri range. The tea gardens are almost identical to the quality of the state. This exclusive hill station, set among groves of Eucalyptus trees is a popular spot with boating facilities. Relax in the comfortable chill of Ooty for the rest of the day. Next morning move on towards an enchanting excursion to Ooty and Coonoor. Visit Botanical Gardens, the Lake for boating and trek towards Dodabetta peak, which provides beautiful views of the surrounding hills and plains at Ooty. 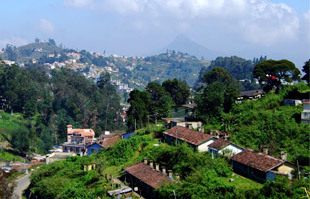 Located at a lower altitude, Coonoor is a second highest hill resort in the Nilgiris. You can take an optional toy train to Coonoor to enjoy the scenic beauty. Otherwise, the hill station’s visit is incomplete with strolling inside Sim’s park, a beautiful botanical garden with many rare flowers, shrubs and trees. Lambs Rock and Dolphin’s Nose are some of the local attractions around Coonoor. Stay in the hotel overnight. Breakfast at Hotel. By noon check-out of the hotel and transfer to Coimbatore Station / Airport to connect to onward destination.